On my first day at WiseOceans as Blue Economy intern, I learnt about a project entitled “Promise To The Reef”. 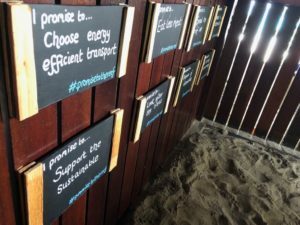 This project engaged my attention because not only does it involve educating people about ways to reduce their negative impact on climate change, but it also attempts to get them even more involved by taking a vow. The first and most important step is to choose the promise you fancy out of the eight available. After a bit of thinking, I chose to promise to “support the sustainable”. Starting from today, I will strive to as much as possible to buy only local products. This affects climate change by reducing the carbon footprint resulting from importing unnecessary goods. My decision was based on the fact that I hadn’t put much effort in the act before despite knowing its positive effect on the environment – guilty as charged! 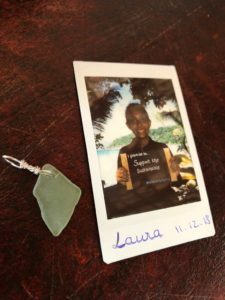 The next steps involves snapping a Polaroid of you holding a board with your promise written on it and hanging it on a ‘string of fame’, followed by choosing a little token made of sea glass as a future reminder of your pledge. Although you won’t go through all the previous steps, I think this is a fun challenge everyone could try out! 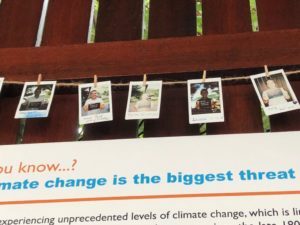 There are plenty of little ways we can help out a little more, when it comes to reducing the rate of climate change. You could even snap your own picture with your promise written down on a piece of decorated recycled paper. So, what promise is it going to be?